This week, we will be at the Spokane Kennel Club dog show at the Spokane County Fairgrounds, Friday-Sunday, May 24-26. Please stop by our booth to talk about your dog, your breed, any health issues that concern you, or to just say "hi". We look forward to learning from you and meeting your needs as a responsible dog owner and breeder. And as always, thank you for your support of Paw Print Genetics! 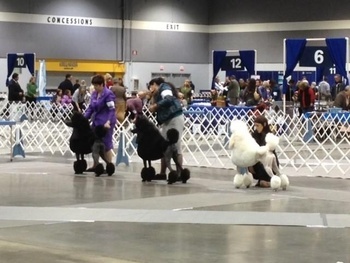 Image: Oodles of Poodles, images from Rose City Classic copyright 2013 Paw Print Genetics, Genetic Veterinary Sciences, Inc.